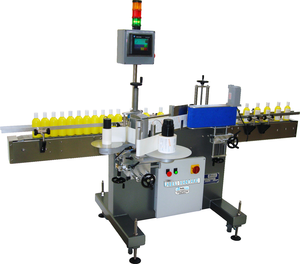 Model LW-40 is a Pressure Sensitive Full & Partial Wrap Labeler for Round Bottles. Labeling Speeds of up to 40meters/ 1,500inches per minute. The labeling applicator adjusts on 5 axes. European design. User friendly controls and a large color touch screen make changeovers easy and quick. Straight in-line automatic labeler for plastic, metal, fiber and glass round containers. Variable speed servo drive motor. Standard label reel diameter up to 300mm/12” with 76mm/3” core diameter. Can accept a web width of up to 4.5” – Larger Available. Wrap station 6” x 14” allowing full wrap of most bottles. Others available. Labeling speed: Up to 40 meters per minute/1,500 in. per minute with independently driven reel holder. Proprietary full 5 axis adjustment of applicator head. Unwind unit gives constant web tension. One piece welded uni-frame (Patented Design) for 24-hour/7-Day operation. Portable epoxy coated steel compact base frame with stainless steel leveling screws with floor pads. Oversize stainless steel shafting with calibrated settings throughout. 8 foot long synchronized variable speed conveyor with Stainless Steel infeed and discharge conveyor sections (Longer lengths and custom layouts available). Clearly laid out operating display for safe and easy use. Color TFT touch screen control system with rotating support for front and rear operation. Label counter down with operator alerts (precisely counts the number of labels dispensed by applicator). Photo-electric non-contact label and bottle detectors. Missing label on bottle detector with screen indicator (For luminescent labels). Base frame to be all stainless steel construction. Indicator stack light: Green light labeler is on (running) red stack light, Labeler is off (not running). Yellow fault stack light to indicate when any fault occurs, in addition to screen indicators. Ethernet networking interface ready for your direct hook up. Extra SS conveyor length (Beyond the standard 8 ft.) per foot. Reject System to push faulty bottles off conveyor if they register as a fault such as missing label. System includes: Pneumatically operated push paddle to gently guide bottles off conveyor, stainless steel mounting bracket, regulator, control valve, pressure gauge with integral program on main sealer control panel. Suitable for bottle sizes of up to one gallon (works with option #2 above). Reject table: Stainless steel construction 12” x 12” square with lip around three sides, to be mounted on opposite side of conveyor to the reject paddle. Suitable for bottle sizes up to one gallon. 110V, 1 Phase, 50/60 Hertz (Nema 12). No air needed on standard machine (unless coders/rejectors, etc. are used) (Approximately 6.0 amps).